My article Himalayan blunder to Himalayan handshake appeared in the Edit Page of The Pioneer today. I am confused. Is Mr Li Keqiang, the new Chinese Premier, a sincere person or is he, like his illustrious predecessor Zhou Enlai, only a smooth-talker? Indeed, he speaks sweetly. In an Op-Ed in a national newspaper, he says: “China and India are destined to be together. They should work hand in hand if Asia is to become the anchor of world peace”. That sounds great. He also says: “We live in an age of change, but there are always certain things that are enduring, forever refreshing and attractive. India is such a nation, at once old and young. …[India and China] represent the two pillars of the civilisation of the East.” But when he states: “Today, the handshake across the Himalayas is even stronger”, is it really true after the border incident in Ladakh? For Mr Li, the present problems are left-overs from ‘history’. One can’t deny this; for centuries the towering Himalayas, as the Chinese Premier calls the border, were ruled by the Dalai Lamas in Lhasa, and the Emperors of the Middle Kingdom had, except for very short periods, little say on the Roof of the World. For India, the ‘left-over of history’ is the Chinese invasion of Tibet in 1950. Stranger is when Mr Li speaks philosophy to stress the importance of making friends with neighbours: “Do not do unto others what you do not want others to do unto you”, he says. Then why did he order his troops to plant their tents on Indian territory? Was he expecting India to do the same to China? Who is the real Mr Li? The one who nostalgically speaks of his student days when he visited India? Or the powerful leader of an authoritarian regime which has disputes with most of its neighbours? Assuming that China had some grievances against India, why could these not be taken up at one of the scheduled bilateral meetings (External Affairs Minister Salman Khurshid’s visit to Beijing or Mr Li’s present trip to India)? Visits to China by the Union Minister for Defence and the Indian Prime Minister are also planned for later this year. There were at least four occasions to solve pending issues, so why take the extreme step of setting up a camp on Indian territory, creating bitterness and distrust? The strangest thing is that Mr Li did not mention any serious grievance against India (at least publicly) during his stay in India. One reason could be that one arm of China (the State Council) did not know what the other (the PLA) was planning. It is not easy to prove, but it remains a strong possibility with scary implications. Is this why Mr S Jaishankar, the Indian Ambassador to China, referred to the Chinese incursion in Ladakh as ‘very unusual’? This is a charitable way to explain the two faces of the Chinese leadership. 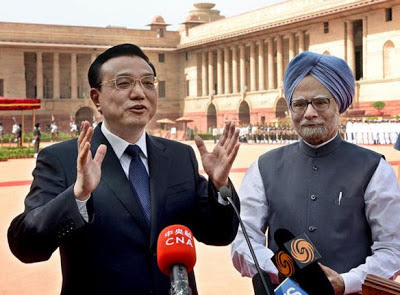 What does not help is that opposite the young and affable-looking Chinese Prime Minister is his shy Indian counterpart. Take the dams under construction on the Yarlung Tsangpo/Brahmaputra in Tibet. In his Joint Statement with Mr Li, Mr Manmohan Singh said: “It would be useful for the mandate of our Expert Level Mechanism to be expanded to include information sharing on upstream development projects on these rivers.” Why say “would be useful”, and not just that India demands a legal mechanism/agreement to access the upstream developments on the Brahmaputra. Small mercy, the Joint Statement does not utter the ‘One China’ policy or mention that “Tibet is an inseparable part of China”. In any case, it has been said ad nauseam. Regarding the border, the Joint Statement suggests: “Pending the resolution of the boundary question, the two sides shall work together to maintain peace and tranquility in the border areas in line with the previous agreements.” What does “in line with the previous agreements” mean? As seen in the Depsang Plains in Ladakh, the Chinese are ready to break all existing agreements when it suits them. This is not unusual for China which often professes something and does something else. In the Joint Statement, India and China reaffirm their opposition to weaponisation and an arms race in outer space. A week earlier, Reuters mentioned that China had launched a rocket into the space and that later the object re-entered the earth’s atmosphere. For Washington, DC, this was the first test for a new interceptor that could be used to destroy a satellite in orbit. Apparently, the Chinese rocket reached 10,000 km above Earth, the highest suborbital launch since 1976. Is this launch not contributing to the arms race in the outer space? Why get India to reaffirm its commitment when China simply does what it wants? In the present circumstances, what can be done? The Prime Minster of India announced that the Special Representatives will soon meet to seek an “early agreement on a framework for a fair, reasonable and mutually acceptable boundary settlement”. India should ask for concrete gestures from China; it is the only way for Mr Li to show that China is ready to match its words with its deeds. The first and most important action is for India and China to exchange maps of all sectors of their common border. It has apparently already been done in the Middle Sector (Himachal Pradesh and Uttarakhand); it should be done without prevarication in the Western and Eastern Sectors as well. It is the minimum that one can expect from ‘a friend and a partner’. But a mere exchange of maps is not enough; the respective ground positions should be made public. Citizens are entitled to know what is happening on their nation’s borders. The Depsang incident has shown that even ‘experts’ lack basic knowledge of the situation on the ground. The blame should be squarely put on the Indian Government whose responsibility it is to inform the Indian public. It is high time that the Government of India publishes a White Paper on its border with China, as was done in the past by the Ministry of External Affairs (between 1959 and 1965, as many as 15 White Papers on the border issue were tabled in Parliament). A well-informed Indian public could eventually provide tremendous support to protect the borders against unwanted intrusions. Another meaningful gesture would be the re-opening of Demchok, the traditional pilgrimage route to Kailash. 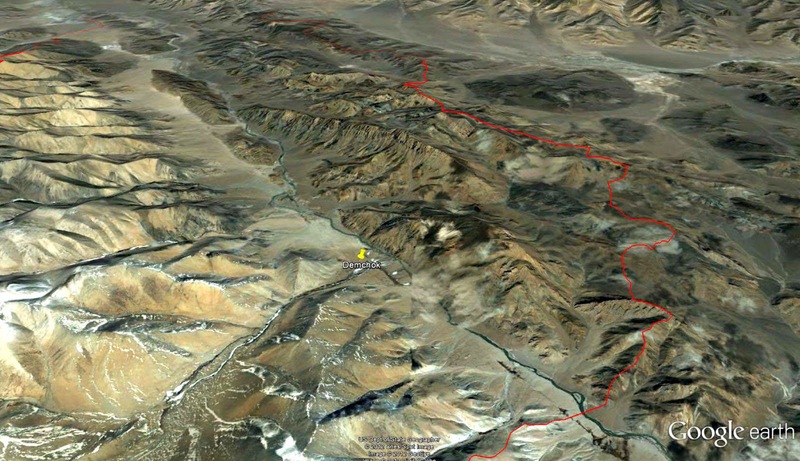 Though the Joint Statement says that China will provide greater facilitation to Indian pilgrims for the Gang Renpoche [‘Kang Rinpoche’ is wrongly spelt in the Statement] which is the Kailash-Manasarovar Yatra, the only route which make sense for a large number of Indian pilgrims is the Ladakh road via Demchok which would make the journey considerably shorter and more comfortable. Of course, like most of the places near the Tibetan border, Demchok is claimed by China (though occupied by India). But if China’s Line of Actual Control perceptions could be put aside on this small area, it would create tremendous goodwill in India and make tens of thousands of pilgrims realise the dream of their life. Chinese leaders like to speak of China’s Dream; they should let Indians dream too. Let Demchok be re-opened, Mr Li! China’s image will receive a tremendous boost.